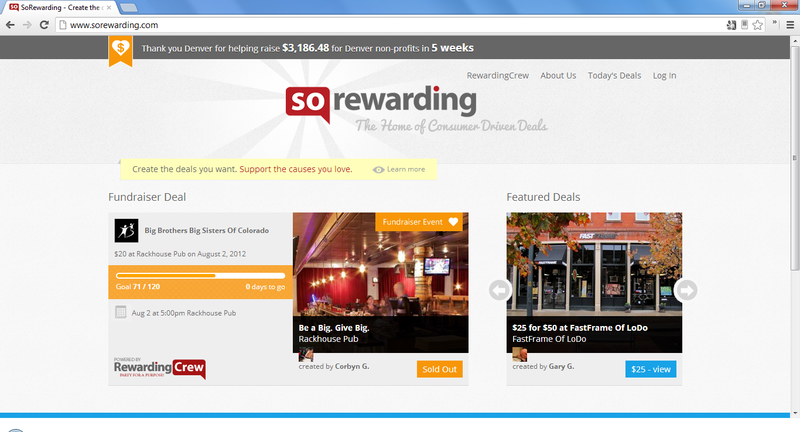 SoRewarding is a social network that unites consumers, merchants and non-profits in a fun, social and practical way. For consumers, they provide a simple on-demand tool that empowers them to request deals from merchants when they need it. This convenient technology lends itself well to consumers who want to discover amazing places in the community with a few clicks of a button. But it doesn't stop there. One of the most powerful features of the CDD (Consumer Driven Deals) technology is the giving component nestled seamlessly into the purchase experience. During the purchase process, consumers select a non-profit to support and once the purchase is made, SoRewarding makes a substantial donation to that non-profit. For merchants, SoRewarding is a simple and convenient tool that enables them to receive deal requests directly from local consumers who are ready to purchase. Driving customers is as simple as clicking the “Accept” button. For non-profits, SoRewarding’s CDD technology has opened the doors to one of the simplest and most effective forms of fundraising available. Integrated tightly into each money-saving deal that consumers purchase, our giving component allows the user to identify the non-profit of their choice and we donate on behalf of the consumer – simple!